Putting your software product in the hands of potential customers and letting them experience the power of what you have to offer not only helps to solidify your value proposition but also makes it tough to part with. Some argue though, that trialware applications are easy to crack – allowing continued use of the software that was originally intended only for trial use – resulting in lost revenue. Join this webcast to learn how to implement secure trialware that enhances the customer experience, reduces cost and complexity - and turns prospects into buyers. El Sentinel Envelope es una envoltura automática de archivos que proporciona protección a la propiedad Intelectual (PI) contra la Ingeniería Inversa de software a través de la encriptación de los archivos, la ofuscación del código y a nivel de sistema anti-debugging que garantizan los algoritmos, los secretos comerciales y el Know-how profesional quedan asegurados contra piratas informáticos. Este WebCast es necesario para cualquier persona interesada en la comprensión de cómo la tecnología de SafeNet Sentinel Envelope ofrece a la industria el más robusto mecanismo de ingeriría anti-reversa protegiendo con el uso de valiosos algoritmos sus secretos comerciales. Registrese Ahora!! The Sentinel Envelope is an automatic file wrapper that provides Intellectual Property (IP) protection against software reverse engineering through file encryption, code obfuscation and system-level anti-debugging ensuring that algorithms, trade secrets, and professional know-how are secured against hackers. This webcast is a must for anyone interested in understanding how SafeNet’s Sentinel Envelope technology provides the industry’s most robust anti-reverse engineering mechanism while protecting valuable algorithms and trade secrets. Register Today! SafeNet’s services are designed to help software, hardware and intelligent device manufacturers successfully deploy a licensing and protection applications that also align with a monetization strategy. Using a proven phased LifeCycle approach, the SafeNet Professional Services team combines project management with both technical and business-focused consulting services. Unlike other vendors who focus only on short-term results, SafeNet is there for your solution as it evolves over its lifetime. Our commitment to you is a scalable software licensing solution that allows you to improve efficiencies, deliver what your customers want and need, increase customer satisfaction and revenue, streamline operations and improve business procedures with a rapid Return-On-Investment (ROI). Want to learn more? 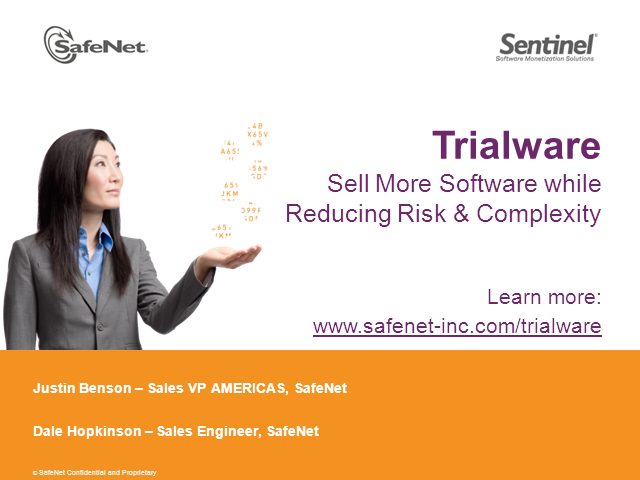 Join us on November 14th, 2012 from 3-4PM ET webcast and learn about SafeNet’s LifeCycle Solutions Methodology, best practices and case studies. Licensing is no longer a set-it and forget-it function. Join this webcast and learn about the upfront work required to build out your strategy and vision before jumping into the technology part of the equation. Please join Dave DiMillo, Principal Consultant-Rights Management, as he shares his expertise and walks you through a best practices framework to help you avoid the pitfalls, unexpected problems and project delays. Join this webcast and learn how to get your software licensing project right the first time. In this 3rd webcast in the Ask the Expert series, we will discuss how the market is changing, it is no longer up to the software publisher to determine how their customers will interact with their products and services. End users are becoming increasingly involved in determining how they want to purchase, use, and manage how they interface with software publishers and their offerings. In order to retain existing customers and to remain relevant in the fiercely competitive B2B software industry, software publishers need to put customer experience at the heart of their software monetization strategy. This presentation will cover several ways that software publishers can and should be leveraging their licensing and entitlement management tools to heighten customer experience and therefore realize greater success. Join us on October 3rd and learn about the four core areas which, with the right tools, can be easily improved in order to make a huge impact on customer experience. Register today! Join us on October 9th and learn about the four core areas which, with the right tools, can be easily improved in order to make a huge impact on customer experience. Register today! Join us on October 3rd at 2PM ET and learn about the four core areas which, with the right tools, can be easily improved in order to make a huge impact on customer experience. Register today! Descripción: Únete al nuestro 3er Webcast en vivo “Preguntale a los Expertos” y aprende como el mercado está cambiando, ya no es el fabricante de software el que determina como los clientes interactúan con sus productos y servicios. Los usuarios finales están cada vez más involucrados determinando la forma que desean comprar, usar y administrar la forma en que interactúan con los desarrolladores de software y sus soluciones.Con el fin de retener a los clientes existentes y para seguir siendo altamente competitivo en el B2B de la industria del software, los fabricantes de software ponen la experiencia del cliente en el centro de su estrategia de monetización de software. Esta presentación cubrirá varias formas en que los fabricantes de software pueden aprovechar sus licencias y las herramientas de gestión de derechos para aumentar la experiencia del cliente y por tanto obtener mayor éxito. Durante éste webcast se discutirá las cuatro áreas básicas, que con las herramientas adecuadas, se puede mejorar fácilmente y tener un gran impacto con en la experiencia del cliente. In response to your requests for a step-by-step guide for delivering a hybrid software portfolio,we are pleased to invite you to join us and leverage Abhishek Banduni's expertise as he walks us through "The Best of Both Worlds - best practices for combining on-premise and cloud-based software delivery models". Join this session on September 4th and learn how to offer a hybrid portfolio for maximum monetization of your software. Únase a nuestros expertos SaaS para aprender de primera mano de qué forma los desarrolladores de software ven las opciones de distribución en la nube y cuáles son las soluciones disponibles para combinar con éxito la distribución de software local y en la nube. Durante este webcast, vamos a discutir; cómo entender como utilizan los suscriptores su servicio y como maximizar los ingresos procedentes de los clientes existentes. Tambien como puede modificar su oferta para conseguir nuevos clientes y dirigirse a segmentos más amplios. La criptografía White-box es un componente esencial adicional que permite a los desarrolladores proteger sus aplicaciones contra la ingeniería inversa, la manipulación y los ataques automatizados. Aprenda cómo la metodología de criptografía White-box de SafeNet se integra en el proceso de diseño del software integrando una capa de protección adicional directamente a nivel de código fuente proporcionando un método altamente efectivo de protección de software. In response to your requests for a step-by-step guide for delivering a hybrid software portfolio,we are pleased to invite you to join us and leverage Mark Horvarth's expertise as he walks us through "The Best of Both Worlds - best practices for combining on-premise and cloud-based software delivery models". Join this session on Jun3 13th at 2PM ET and learn how to offer a hybrid portfolio for maximum monetization of your software. Before making the big decison to build your own licensing solutions, join us on this live webcast and hear first hand from Niles Leisti, one of Safenet’s Lead Technical Support Engineers, about real world lessons learned from homegrown solutions gone wrong and tips for moving forward. Hindsight is 20/20. White box cryptography is an additional essential component that enables developers to protect their applications against reverse engineering, tampering and automated attacks. Join this webcast and learn about: 1. Threats as related to dongle emulation 2. The importance and the weaknesses of the "secure channel" between the application and the protection key. 3. Solving the dilemma in white box cryptography between encrypting/decrypting content without revealing any of your sensitive data. REGISTER TODAY. This session brings together many of the presenters from earlier events in the series into one highly experienced panel of cloud service delivery experts. Moderated by industry renowned Jeff Kaplan, managing director of THINKstratigies, this interactive ‘virtual panel’ will provide attendees with direct access some of the most respected executives from Agilis Solutions, Dell Boomi, SafeNet, and Zuora. Guided by real-time inquiries from the audience, Jeff will spear-head a energetic dialogue guaranteed to answer some of the toughest questions around success in the cloud. Topics to be address are sure to include business model strategies, lessons learned (the good, the bad, and the ugly), team structures, partnering strategies, application billing and management, and much more to be determined by you and the other participants. For software vendors, success in the cloud is reliant on a lot more than just building a useful service; it is about the organization’s ability to effectively monetize that solution. Successful monetization in the cloud is really dependent on two key factors: a software vendors ability to package, provision, control, and track usage of the application itself, and equally as critical, is the ability to offer customers subscription and pay-as-you-go pricing options and manage the customer lifecycle from initial purchase to upgrades to renewals. Jeff Yoshimura (Zuora) and Jake Fox (SafeNet) will walk you through best practices for approaching each aspect of software monetization in the cloud, enabling you to shorten time to market, simplify customer capture, fuel product innovation and ultimately maximize profitability. Many Independent Software Vendors (ISVs) are facing the question of whether they should move their traditional on-premise products to the cloud and, if so, how can that be done. Eileen Boerger, President of Agilis Solutions, the leading provider of software development services for companies in the business of building software products, will discuss the key planning, architectural, design, and implementation considerations for moving an on-premise product to the cloud. With several successful client migrations under her belt, Eileen will leverage a case study to highlight one clientÃ¢ÂÂs evolutionary approach to moving an existing on-premise product to the cloud Ã¢ÂÂ including lessons learned that you canÃ¢ÂÂt afford to miss. The software licensing community to share ideas and find experts. Welcome to LicensingLive, a network of online communities dedicated to providing software vendors, industry analysts, licensing consultants, and technology vendors with a variety of forums to connect with peers, voice questions, share information, compare best practices, and brainstorm emerging challenges associated with software licensing, fulfillment, delivery and management.